I made this sometime ago for capturing screenshots to files automatically. Aim to save some time, and to fully utilize the possibility of parametric routine: Change parameters and see what happens. It works joyfully if you want to change parameters and generate screen captures and planning to do a lot of them. You can of course generate the file name dynamically referring to the parameters you gave to the script, so that you have meaningful file names. 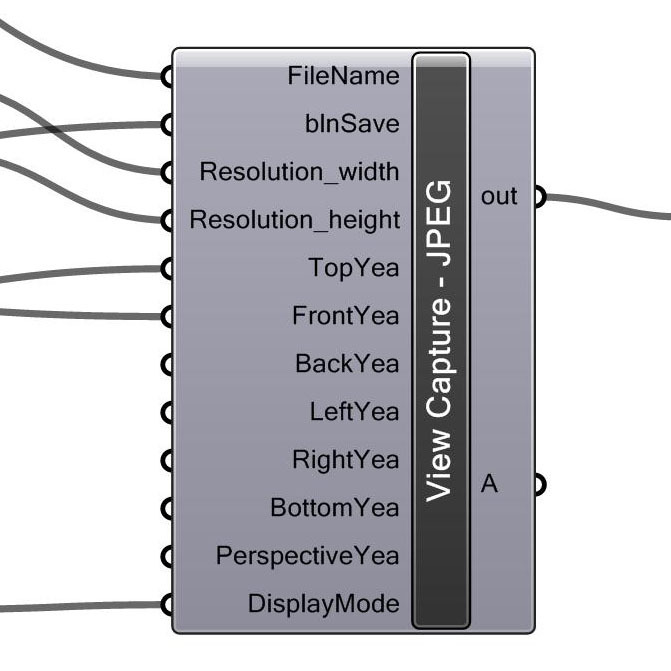 The example below will generate two captures at J:\Temp\001_top,jpg and J:\Temp\001_front,jpg both at 600X600 px in ghosted mode. ‘ Note1: The script is actually calling Rhino commands. ‘ Note3: After you toggle blnSave to True, a new viewport will popup, be patient while Rhino work, and wait for that viewport to disappear befor clicking on anything. ‘ Note4: The component is not stable if you try to mouse click on anywhere while the saving process is running. Some stupid move may crash your programme, save RH and GH files before using this component.